Napapijri Mens Designer Clothing at Mainline Menswear. 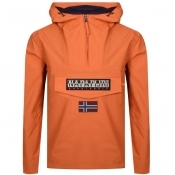 Mainline Menswear stock a wide range of Napapijri jackets, jumpers, t shirts and shirts. The Italian premium casual-wear are the experts when it comes to outdoor clothing. With famous celebrities, such as Ashton Kutcher wearing the brand, youll be in good company with our Napapijri range.A Brief History of NapapijriNapapijri began life as a company focused on the extreme conditions of the Arctic Circle. In fact, the name Napapijri does in itself literally translate as Arctic Circle in Finnish.. The company has been with us since the late nineteen eighties, even though originally, the brand started trading under the name Green Sport Monte Bianco. A swift name change later, and the subtle colours and indeed highly effective protective nature of the Napapijri clothing line has seen it blossom into a huge brand in its very own right. These days, alongside the same exploration-themed clothes on which the company was built, Napapijri also offer a huge selection of fashionable, easy going items for good measure.